The hundred or so islands of Shetland are formed by a range of ancient hills standing on the continental shelf and partly drowned when sea levels rose 400 feet at the end of the last ice age, about 10,000 to 12,000 years ago. Shetland is as far north as Anchorage, Alaska. Though Shetland lies in the track of the Atlantic depressions and is bathed by the relatively warm waters of the Slope Current, flowing north along the edge of the Continental Shelf, so the climate is classified as a Maritime Climate. Maritime climates tend to have cool summers, warm winters and minimal change in temperature throughout the year. In the past Shetlander’s lives were bound to the sea. Most men became fishermen, seafarers and, whalers. Leaving the woman to take care of the croft. One way to earn money for general food supplies was through the craft of knitting. Many women took to their needles to feed their families. 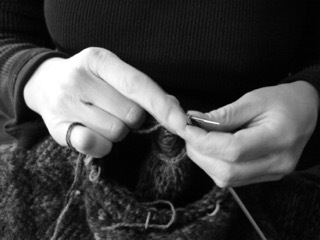 Creating beautiful knitwear along the way and giving us the craft of Fair Isle knitting as well as Shetland lace knitting.